Boys use supplements as motivation to step up to the plate and buy a gym membership. Men use supplements to forge their already powerful bodies into a fortress of impenetrable iron. As a youngster, you heard that food—and more food—was all a "growing boy" needs. As a man, you know that nutrition and training are the fundamentals of a healthy lifestyle. But what if you want to keep growing? If you're not quite "there" yet, maybe it's time to add the types of nutrients that can't be provided by food alone. You need supplements that incorporate quickly into the body tissues, prime you for intensity, and repair your torn muscle tissue. Finding the confidence to step into the gym and lift with the veterans is no stroll through the park. The intimidation factor is real. It's probably the reason thousands steer clear of the gym, afraid to look weak and unseasoned. How do you combat the shrinking feeling and show the goliaths you're here to stay? Easy: with supplements that turn boys into men. Boys can make it through the day on candy and caffeine. Men need a high-quality isolate protein powder stacked with rapid-digesting carbohydrates and amino acids. Isolate protein powder delivers amino acids to working muscle tissues immediately. The fast-acting carbohydrates spike insulin levels, which pushes protein into cells and refills spent muscle glycogen. Some people prepare their own protein/carbohydrate post-workout shake, but if you purchase a protein powder that already has carbohydrates, or a carbohydrate supplement, it does a lot of the work for you. Men often have higher carbohydrate requirements than women after workouts, because they have more muscle mass to support. 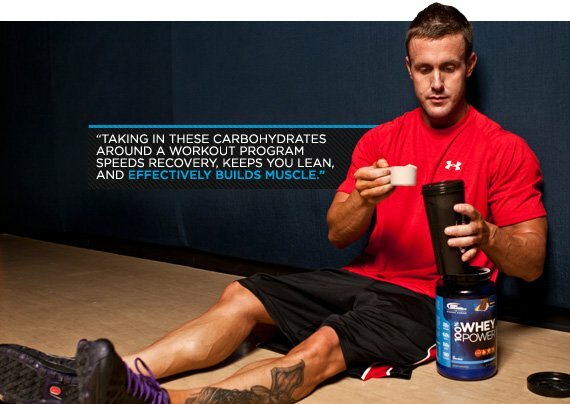 Taking in these carbohydrates around a workout program speeds recovery, keeps you lean, and effectively builds muscle. A man knows to use the right tool for the job. Creatine is the primary component of the molecule that fuels exercise. Ensuring the body is saturated with creatine helps you across all training spectrums, and especially for athletics that require high-intensity bursts. Pair creatine with nitric oxide and you'll stay strong through more reps and in endurance training. Oxygen efficiency is a primary determinant for exercise longevity, and nitric oxide dilates blood vessels so oxygen can flow throughout the tissues and into the muscle cells. Increased oxygen delivery enhances creatine delivery, too. This 2-headed beast helps prevent fatigue and keeps working well into recovery, so you'll be ready to man up long after the boys head home. Boys play. Men approach their workouts seriously and prefer to lift heavy. But over time, the intensity associated with heavy lifting can wear on the nervous and immune systems. This can make you nauseated and affect your post-workout recovery. Foods like beef, chicken, fish, eggs, milk, dairy products, wheat, cabbage, and beans all contain glutamine, but not enough to overcome the amount of strain put on muscles by lifting. Glutamine supplementation is vital for weightlifters, but not because of what it does during the workout. Think of it this way: You can't become stronger if you don't recover! Adding 5-10 grams of glutamine to your post-workout shake, and another 5-10 before bed will have significant impacts on your results. It's one of the most effective supplements for men who train intensely. One of the hard truths about being a man is that almost as soon as you become one, your testosterone levels start dropping. Exercise and lifting deplete your levels of zinc and magnesium, which can cause your levels to take another hit. What's a guy to do? Maximizing testosterone levels in the body promotes faster muscle growth and recovery. Testosterone boosters help speed that process. The two most common ingredients in testosterone boosters are ZMA and tribulus. Taking these individually or as part of a supplement stack can boost natural processes in the body and increase results. Then there's growth hormone, which kicks in at the onset of sleep. Test boosters, and specifically ZMA, which is often taken before bed, promotes increased testosterone levels and the production of growth hormone. Aside from supplements, be mindful of natural ways to maintain high testosterone levels in the body. Get at least eight hours of sleep, take in healthy proteins and good fats, and rest appropriately between heavy sets. But if you've got the basics down, then it may be time to integrate a test booster into your supplement stack.